When our house is not working for us, many of us have a knee-jerk reaction that we need more space. In many cases, however, what we really need is better space – space that supports how we actually live our lives. Consider all the different uses that you would like to make of the space before beginning a remodeling project. Do you want to use the kitchen as a place to do homework or pay bills as well? Will the family room also serve as an exercising or entertaining area? Could the space under the stairs also be used for storage or as a reading nook? To squeeze the most living out of a space, make sure that it performs multiple functions. Children grow up, grandchildren come, we get older or get new hobbies … your spaces should accommodate your ever-changing life. 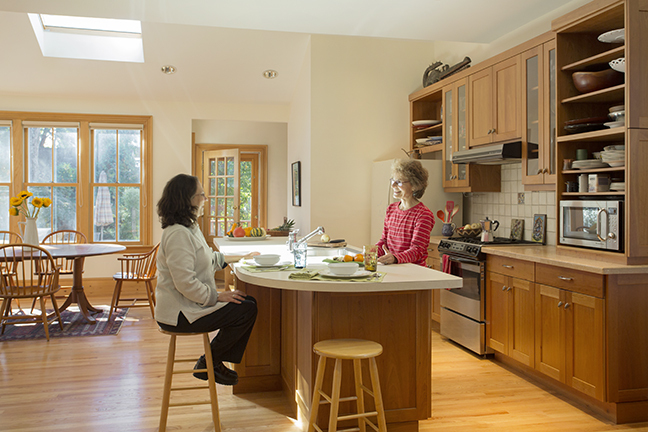 Think about your needs today and a decade or two from now when planning a renovation. A room should be easy to use. You shouldn’t have to walk around obstacles or get down on the floor to access important storage. There should be easy access into and out of your space. With careful planning, it is possible to discover all kinds of untapped storage spaces without expanding a home’s footprint. Storage can be tucked into niches, under staircases, around doors and even hidden beneath stair treads. A remodeling project should always begin with probing questions to get to the heart of what you need to make a space work for you. At Morse Constructions, we ask exploratory questions that range from what you like and don’t like about your current space, to the hobbies that you enjoy, to your entertaining style, to how you envision your life in the future. Give us a call to find out how we can help you make the most of your existing space.